This Sunday, the woman who comes forward to ask Roy Masters for help becomes a catalyst for a great deal of change; but not only for herself. If what you witness here could be seen across the country it might be the wake-up call we need right now. The American people, unbeknownst to most, are not themselves. We have given in (to go along) for so long we find ourselves in a dangerous state of enslavement and servitude to tyrants. With an epiphany, similar to what you will see here, lies the perfect, no-effort answer. There is something about ourselves we need to see, not something we need to fight. This is all about intuition and the spoken word. 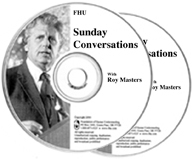 Roy Masters, who turns intuition into language, helps a lady reconnect to her own intuition. Like a baby taking its first steps, the woman starts to move from her own intuition. She is on her way to finding her freedom from the tyrant of language.